The paper presents the development and investigation of an adaptive-smoothing (AS) procedure in conjunction with a full multigrid (FMG) — full approximation storage (FAS) method. The latter has been developed by the authors  for solving the incompressible Navier-Stokes equations, in conjunction with the artificial-compressibility method and a characteristic-based discretisation scheme, and forms here the basis for investigating the AS approach. The principle of adaptive-smoothing is to exploit the non-uniform convergence behaviour of the numerical solution during the iterations in order to reduce the size of the computational domain and, thus, reduce the total computing time. 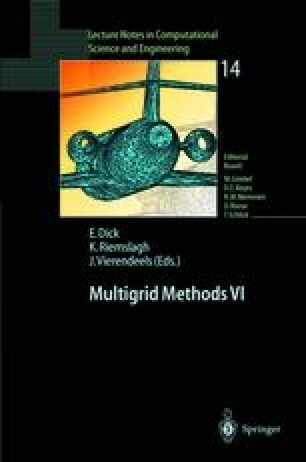 The results show that significant acceleration of the multigrid flow computations can be achieved by using adaptive-smoothing.